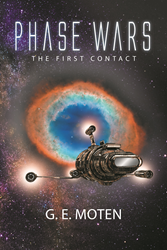 Recent release “Phase Wars: The First Contact” from Page Publishing author G. E. Moten is a compelling and transfixing tale with day to day changes for everyone in the United Trade Coalition, as many are feeling the devastating aftermath of war, corruption, as well as economic depression. G. E. Moten, a passionate and avid writer, has completed his new book “Phase Wars: The First Contact”: a gripping and potent sci-fi adventure of a new threat to the already shattered Trade Coalition, as the ruthless Tamarids seek to form their empire in the Milky Way. Moten’s fascination with Science Fiction came from his father, introducing him to franchises such as Star Wars, Stargate, Battlestar Galactica, etc. He began writing at age 13, all of which has been Science Fiction/Fantasy, but also has a passion for History and plans to experiment on Historical Fiction in the future. Published by New York City-based Page Publishing, G. E. Moten’s spellbinding tale depicts how the Trade Coalition must end their political disputes to save whatever they and their ancestors have built for the last few centuries. Five years after the Unification Wars, a six-year long conflict that wreaked havoc and destabilized the vast majority of sovereign territory of a powerful interstellar economic nation known as the United Trade Coalition. The day to day life cycle changes for everyone, as many are feeling the devastating aftermath of war, corruption, as well as economic depression. A quarter of the human population is gone and the rest struggle to find their ways through the ruins of what was a prospering trade entity. However, the year is now 2749 and there is a new threat that is now beginning to arise among the already shattered Trade Coalition. An extragalactic alien civilization known as the Tamarids who seek to assert themselves in a ruthless effort to form their new empire within the Milky Way Galaxy. Readers who wish to experience this mesmerizing work can purchase “Phase Wars: The First Contact” at bookstores everywhere, or online at the Apple iTunes store, Amazon, Google Play or Barnes and Noble.